Most likely, by now, you have heard of the anti-dumping cast iron case that has been going on for some time now. On February 14, 2018, the Department of Commerce stated that it found enough evidence to make an affirmative preliminary determination in the antidumping duty investigation of imports of cast iron soil pipe fittings from China. Promoted by Energy Metals, Inc. Attend NETWORK2018 and hear the latest industry information that ensures your company’s solid foundation for 2018 and the future. You will have various opportunities for education and networking along with the opportunity to hear speakers who will share valuable information that you can directly apply to your business. One highlight of NETWORK is the Wholesaler and Vendor Conference Appointments on Thursday afternoon. NETWORK2018 cultivates the value of connecting TOP DECISION- MAKERS from both sides of the marketplace all in one room. Liberty Pumps introduces NightEye® wireless enabled products. The app and cloud-based system allows internet connection of a pump via the home’s wireless router and provides alarm and other performance information to your mobile device. For more information visit www.libertypumps.com/nighteye or look for Liberty products with the NightEye® logo. 4 building blocks that can help drive a potentially successful team partnership by a new leader. Boshart Industries offers No Lead Chrome Plated Supply Stops with an easy shutoff for maintenance and repair. Our valves are certified to the NSF/ANSI Standard 61 & 372 and the CSA Standard B125.1. Available in a multitude of designs and sizes to meet your connection needs. 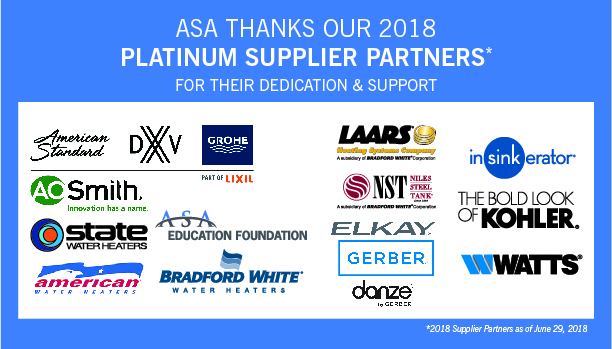 Each month, ASA partners with Industry Insights and ITR Economics to compile data from wholesaler members that provides a snapshot on industry performance as well as how it relates to the broader economy. The value of this report is directly related to the number of wholesaler firms that contribute data each month - the greater the number of respondents, the more comprehensive and useful is the report and accompanying analysis. The participation deadline for wholesaler members to submit data for the June report is TODAY. Learn more about this FREE and EXCLUSIVE benefit that ASA members frequently use when making key decisions. Curious about how your website can really speak to your customers? Cooney Brothers is doing interesting work to leverage product information, SEO, and onsite website education to build a customer-centric website. In a new interview, this distributor discusses how they make this program work for their business. Read the full article here. Must be registered to access. Sign up for free here. ASA-U is now offering access to two new courses from Basco. Stay up to date with the latest trends, product features, benefits, and specifications. Enroll today! *Do you want your company’s training featured? Learn how! Congratulations to the ASA-U learners who took advantage of HOLDRITE’s promotion and earned themselves a $50 BlueBucks bonus. A special shout out to the winner of the random drawing- Lee Supply Corp.’s Jay Schnitkey on winning $500!